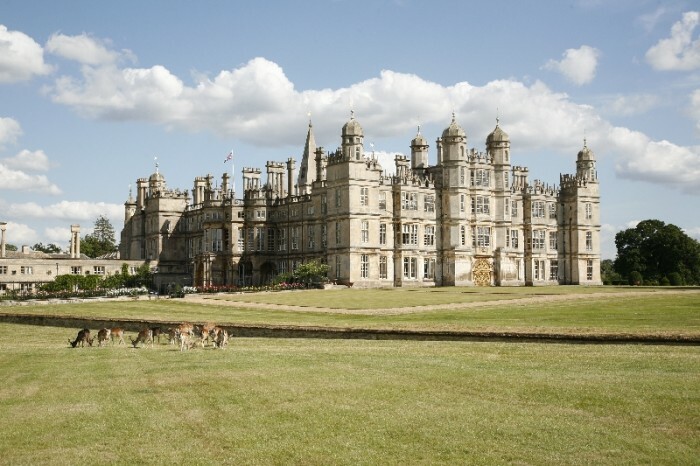 Juliet Rix discovers the connection between Burghley House in Lincolnshire and the Olympic Games, thanks to the exploits of its athletic former owner and Olympic hurdler David Cecil, Lord Burghley. In the Oscar-winning film Chariots of Fire, the flamboyant hurdler Lord Andrew Lindsay is shown practising in the grounds of his country estate, with glasses of champagne delicately balanced on the hurdles as he skips over them. His character is based on David Cecil, Lord Burghley, who won a gold medal at the 1928 Amsterdam Olympics and silver in 1932 before going on to become Chairman of the Organising Committee for London 1948 Olympics. His former home, Burghley House, is one of Britain’s greatest Elizabethan mansions, which is planning to celebrate its unique Olympic connections this summer. A special exhibition displays Lord Burghley’s Olympic medals along with the outfit he wore for the gold medal-winning race and his marvellously outdated brown leather running shoes. Here too is one of the (very few) torches used to carry the Olympic flame into London in 1948 and details of Lord Burghley’s role as “the Seb Coe of the 1948 Games,” says his granddaughter, Miranda Rock, today’s custodian of the house, who lives here with her husband and four young children. Miranda will be in the grounds on 3 July when the 2012 Olympic flame comes to Burghley, and is organising The Great Olympic Garden Party, with a huge projector screen due to be erected in the family’s private gardens in order to show Olympic coverage throughout the Games. On a few nights feature films will be screened, starting with Chariots of Fire on 28 July. More importantly, the film shows Harold Abrahams racing around Trinity Great Court in Cambridge in the time it took the college clock to strike noon. In fact this remarkable feat of speed belongs to Lord Burghley and remains an unbroken record despite attempts to beat his time by both Steve Ovett and Seb Coe. David, Lord Burghley became the 6th Marquess of Exeter on the death of his father and inherited Burghley House – continuing an unbroken line reaching back to Elizabeth I’s closest advisor, William Cecil. As the first Lord Burghley, he built the house between 1555 and 1587, designing it himself in the shape of an E for Elizabeth. Cecil’s intention was to impress his Queen but just as Elizabeth was about to visit, his daughter contracted smallpox. The Queen never came, which must have been a bitter disappointment to “the old man” as Lady Victoria affectionately refers to her ancestor. There will however be an alternative Elizabethan royal visit this summer, when Queen Elizabeth II comes here for a private Jubilee picnic. Miranda does not own the house. When her grandfather inherited, he was faced with massive death duties and had to sell important items from the house’s art collections. Determined that this should never happen again, he created a trust which states that a suitable member of the family shall be appointed by the trustees to inhabit and run the house. On his death, the title of Marquess passed to his brother in America (and remains there with his descendants) and his daughter Lady Victoria, already a renowned expert in ceramics and antiques (and frequent contributor to the TV programme Antiques Roadshow) became the first Director of the House. Miranda had to apply for the job. Besides having been brought up at Burghley, she is an art historian with an MA in Arts Policy and Management. Her formidable task is to protect and preserve this vast historic property with over a hundred rooms and 1,300 acres of park and gardens, including a sculpture garden and the Garden of Surprises. The latter is an interactive water garden – a modern, child-friendly take on William Cecil’s Tudor trick garden. Miranda is also tasked with preserving the house’s formidable contents, including the most important private collection of 17th-century Italian paintings, the earliest inventoried collection of Japanese ceramics in the West, exceptional 18th-century furniture and much else. She has to balance the budget and keep the 18 state rooms in a fit state for the 100,000 visitors welcomed every year. While William Cecil built the house, the interiors and contents owe more to John, 5th Earl (1648-1700) and Brownlow, 9th Earl (1725-1793). “They went shopping,” says Miranda. The 5th Earl was one of the first Englishmen to take the Grand Tour of Europe. He and his wife travelled for years buying and commissioning paintings, tapestries, statuary and furniture. At home, the 5th Earl began a huge renovation project, commissioning French Huguenot ironworker Jean Tijou to produce the golden gates for the West Front, English sculptor Grinling Gibbons to create woodcarvings, decorative plasterer Edward Martens to model over 20 baroque ceilings and Italian artist Antonio Verrio to paint luxurious frescoes. His terrifying Hell Staircase leads to the delightful Heaven Room, where lifesize figures seem to step out of the classically landscaped walls. The 5th Earl finally ran out of time and money, leaving huge debts that hobbled the next three generations before his great grandson, the 9th Earl could finally finish the job. Three interiors remain Tudor: the rib vaulted Old Kitchen, with a central lantern chimney, the Great Hall and the stone ‘Roman Staircase’, adorned with carved Tudor roses. In the Billiard Room hang six oval portraits of members of the 5th Earl’s Burghley drinking club, The Honourable Order of Little Bedlam, each depicted with an animal alter-ego. Sir Isaac Newton is here as is the Dean of Windsor, painter Geoffrey Kneller and Antonio Verrio (a prickly man depicted with a porcupine). Richly embroidered four-poster beds contrast with a little iron campbed, last slept in by the young Princess Victoria, whose mother insisted she sleep close to her own opulent state bed. Victoria visited again as Queen, and Burghley curator Jon Culverhouse recently unearthed a surprise. Under a pair of the Queen’s gloves, long displayed in a glass dome, he found a pair of Albert’s gloves and a charming personal letter from the Prince Consort to the 2nd Marquess, suggesting the name Victoria for his new daughter and offering himself as her sponsor (Godfather). Burghley has a habit of suddenly revealing new treasures, says Lady Victoria: “It is a very benign house and just when we are desperate for something for an exhibition, time and again it has provided.” There was no need to dig deep for the Olympic exhibition, particularly for its most unusual exhibit, which owes much to the 6th Marquess’s sense of humour. Having ruined his joints hurdling, he was an early recipient of an artificial hip. He wore this out too and when it was replaced he had it sprayed silver and stuck on the front of his Rolls Royce in place of the Spirit of Ecstasy. It now stands in the exhibition, adorned with a tiny Burghley crest under which, just legible, are the words: “A loyal supporter 1957-1967”. What would the Olympic Marquess think of the 2012 Games? He would be thrilled no doubt, but also “appalled” by the commercialisation, says his daughter. This chimes with Miranda’s acute awareness of her grandfather’s legacy. While money has to be raised to preserve the house, she says, “the [commercial] tail must never wag the dog.” And certainly, Burghley still feels like exactly what it is: a long-established, English family estate.